The humanitarian toll from such an indiscriminate weapon would far outweigh any military utility. Cluster bombs indiscriminately kill and maim innocent civilians—the same civilians the U.S. is trying to protect. The U.S. Campaign to Ban Cluster Bombs calls on the United States to refrain from using any form of cluster munition in possible military actions in Syria. The Campaign also supports the international Cluster Munition Coalition (CMC) in its call on the 112 countries that have joined the Convention on Cluster Munitions to help ensure that these weapons are not used by the U.S. in Syria. According to the New York Times, several U.S. officials have said that Syria strike plans include use of Tomahawk cruise missiles launched by the U.S. Navy. Tomahawk cruise missiles can carry a variety of different kinds of warheads; one Tomahawk model has a capacity for a weapons payload of 166 BLU-97 cluster submunitions. "Cluster bombs indiscriminately kill and maim innocent civilians—the same civilians the U.S. is trying to protect," said Zach Hudson, coordinator of the U.S. Campaign to Ban Cluster Bombs. "Regardless of whether you support or oppose U.S. intervention in Syria, cluster bombs simply should not be used. Their humanitarian toll far outweighs any military utility." The CMC has repeatedly condemned Syria’s use of cluster munitions as have more than 100 states, including dozens like the U.S. who are not yet States Parties to the Convention on Cluster Munitions. In October 2012, the then-Permanent Representative of the U.S. to the United Nations, Ambassador Susan Rice, said that cluster bomb use by Syrian government forces was an example of "atrocities" by the Syrian regime. In May 2013, the United States also voted for a UN General Assembly resolution that strongly condemned Syria’s use of cluster munitions. "The United States has condemned cluster munitions use by other countries like Syria," said Hudson. "It would be entirely hypocritical for the administration to now use this weapon." The last reported use of a cluster munition by the U.S. was in December 2009 in Yemen, when one or more Tomahawk cruise missiles loaded with BLU-97 bomblets struck the hamlet of al-Majala in the southern Abyan province. The strike killed at least 41 civilians and at least four more civilians were killed and 13 wounded by unexploded bomblets after the attack. Four years later, the site of the attack remains contaminated by cluster munition remnants. The United States also used Tomahawk cruise missiles with BLU-97 bomblets in strikes in Iraq between 1991 and 2003, in Serbia in 1999, and in Afghanistan and Sudan in August 1998. "We call on all states that have joined the Convention on Cluster Munitions to urge the U.S. to explicitly rule out any use of cluster munitions in military operations in Syria," said CMC Director Sarah Blakemore. "Any use of these weapons would contradict the purpose of the Convention on Cluster Munitions to prevent the suffering and casualties caused by cluster munitions." Under Article 21 of the Convention on Cluster Munitions, all States Parties have a legal obligation to discourage non-signatories from using cluster munitions. States Parties have repeatedly reiterated their obligation under the convention to "discourage in every way" any use of cluster munitions. Neither the United States nor Syria is a States Party to the 2008 Convention on Cluster Munitions. The U.S. has joined the 1993 Chemical Weapons Convention, but Syria has not. "Cluster munitions used by the Syrian regime have already caused numerous civilian casualties as they have done in every other conflict in which they have been used," said Blakemore. "It makes absolutely no sense to use banned weapons to retaliate for the use of another banned weapon." Under the 2008 U.S. Department of Defense policy, by the end of 2018 the U.S. will no longer use cluster munitions that result in more than one percent unexploded ordnance (UXO). The policy requires Combatant Commanders to approve the use of cluster munitions that exceed a one percent unexploded ordnance rate. The BLU-97 bomblet does not meet this criteria of a less than one percent failure rate. In addition, U.S. law requires that recipients of U.S. transfers of cluster munitions agree the cluster munitions "will not be used where civilians are known to be present." The USCBL, currently coordinated by Handicap International, is a coalition of thousands of people and U.S. non-governmental organizations working to: (1) ensure no U.S. use, production, or transfer of antipersonnel landmines and cluster munitions; (2) encourage the U.S. to join the 1997 Mine Ban Treaty and the 2008 Convention on Cluster Munitions; and (3) secure high levels of U.S. government support for clearance and assistance programs for victims of landmines, cluster munitions and other explosive remnants of war. 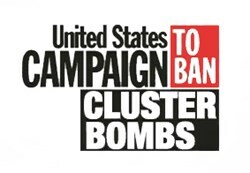 The USCBL is the U.S. affiliate of the Cluster Munitions Coalition (CMC). Cluster bombs (cluster munitions) are large weapons which are deployed from the air by aircraft including fighters, bombers and helicopters. These bombs open in mid-air and release dozens or hundreds of smaller submunitions. The CMC is an international coalition of non-governmental organizations (NGOs) working in around 100 countries to encourage urgent action against cluster bombs. The CMC facilitates NGO efforts worldwide to educate governments, the public and the media about the problems of cluster munitions and to urge universalization and full implementation of the 2008 Convention on Cluster Munitions. Communications Officer, Handicap International U.S.